Box Text: Advance Wars Reborn! On a planet devastated by an apocalyptic meteor shower, one band of survivors must unite to save the last remnants of humanity. *Deploy new units in turn-based tactical warfare! *Design, upload, and trade custom maps worldwide via Nintendo WFC! *Secure victory with an all-new cast of characters, then battle friends around the world. 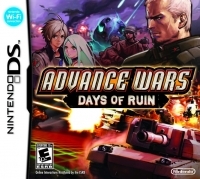 05-24-2016 Box Text Advance Wars Reborn! On a planet devastated by an apocalyptic meteor shower, one band of survivors must unite to save the last remnants of humanity. *Deploy new units in turn-based tactical warfare! *Design, upload, and trade custom maps worldwide via Nintendo WFC! *Secure victory with an all-new cast of characters, then battle friends around the world. 01-11-2016 silverbow Box Text Advance Wars ReBorn! On a planet devastated by an apocalyptic meteor shower, one band of survivors must unite to save the last remnants of humanity. 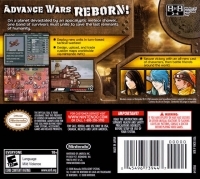 05-13-2012 disgaeniac Box Text Advance Wars ReBorn! On a planet devastated by an apocalyptic meteor shower, one band of survivors must unite to save the last remnants of humanity. 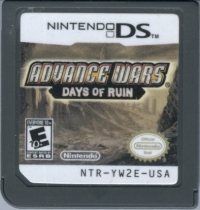 This is a list of VGCollect users who have Advance Wars: Days of Ruin in their Collection. This is a list of VGCollect users who have Advance Wars: Days of Ruin in their Sell List. This is a list of VGCollect users who have Advance Wars: Days of Ruin in their Wish List.